Catherine Flanagan of Hartford, Conn., was a state and national organizer for the National Woman’s Party. She was formerly secretary for the Conn. Woman Suffrage Association (CWSA). Her father came to the United States as a political exile because of his efforts in the movement for Irish freedom. She decided to travel to Washington on her vacation and participated in the picketing at the White House in August of 1917. During the second week, the women were attacked by the crowd and their banners were taken from them and torn apart. The women refused to disperse, were arrested for disrupting traffic and sentenced to 30 days at the Occoquan Workhouse in Lorton, Va.
Flanagan, after arriving back in Connecticut, commented to reporters, “I am perfectly willing to go back to the picket line. I feel that it is a little thing to do toward the accomplishment of such a great purpose, especially since it seems to be the only thing left for us to do now.” She was so revered by her fellow suffragists that when Connecticut ratified the 19th Amendment, she was asked to present the historic document to the U-S Secretary of State, Bainbridge Colby. Sources: Excerpts from Doris Stevens, Jailed for Freedom (New York: Boni and Liveright, 1920), 359. Bridgeport Herald, Sept. 23, 1917. Hartford Courant, Aug. 18-25 and Sept. 13-16, 1917; Sept. 15, 1920. Hartford Daily Times, Sept. 15, 20, 1920. Meriden Morning Record, Aug. 26-Sept. 21, 1920. 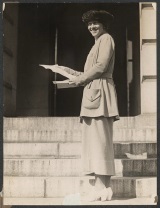 Library of Congress, Records of the National Woman’s Party, American Memory Project. Rampant women: Suffragists and the right of assembly by Linda Lumsden. Votes and More for Woman: Suffrage and After in Connecticut by Carole Nicho Collection.